Although primary cardiac osteosarcoma is uncommon, cardiac neoplasms should be in the differential diagnosis of cardiac complaints. We present a case of a 35 year old man with recurrent episodes of exertional chest pain and who was diagnosed with primary cardiac osteosarcoma. Cardiac osteosarcomas are rare but must be suspected. Cardiac complaints are one of the most common reasons for seeking medical care. Coronary artery diseases, congestive heart failure, valvular diseases, and arrhythmias are the primary etiologic causes. Cardiac neoplasms may have similar presentations but have been often overlooked because of rare occurrence. In most instances cardiac tumors are metastases. Myxomas are the prototypical primary benign cardiac tumors, and sarcomas occupy the first place in primary cardiac malignancies. We present a case of primary cardiac osteosarcoma, which is a very rare subtype of cardiac sarcoma. This case teaches us that having knowledge about uncommon differentials and taking them into consideration in the appropriate context is an important, inseparable part of medicine to be learned and used in practice. A healthy 35-year-old man presented to the emergency department with 1-month history of episodic exertional chest discomfort during exercise. He had the habit of weekly mountain climbing and running. On physical examination, there was nothing significant except a mild systolic murmur at the left sternal border. An electrocardiogram (ECG) showed normal sinus rhythm, and the laboratory results were within normal limits. He had several medical consultations after the onset of symptoms and was attributed a non-cardiac pathology based on ECG and an exercise tolerance test with no obvious abnormal finding. 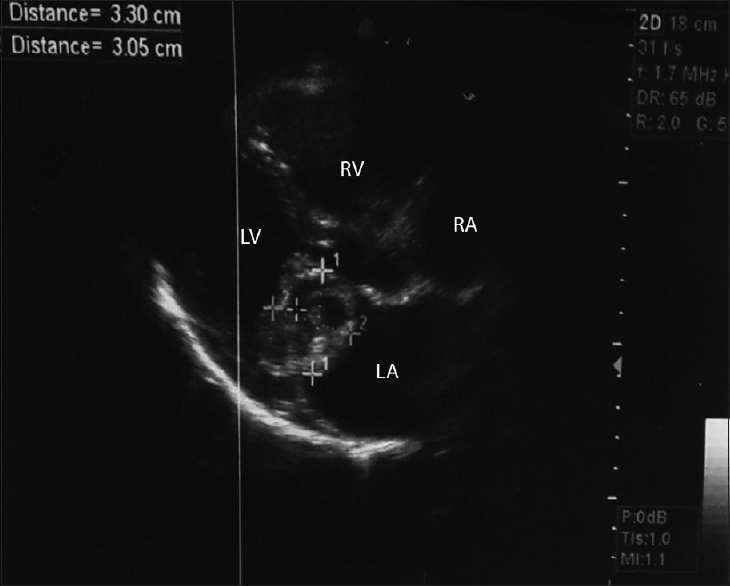 A prominent left atrium (LA) chest X-ray directed to echocardiographic examination which revealed a large (33 × 30 mm) round-shape heterogenous highly mobile mass in LA [Figure 1] adhering to anterior mitral valve leaflet and protruding into the left ventricle during diastole. On diagnosing a cardiac tumor, probably atrial myxoma, the patient underwent surgical intervention. Macroscopically, the excised specimen contained two sections: an atrial mass measuring 3.8 × 3 × 2 cm (a multilocular hemorrhagic cystic lesion with a grayish color) and an atrial mass stalk (a grayish tissue) measuring 0.7 × 0.6 × 0.4 cm. Histopathologic examination revealed neoplastic growth of highly atypical and mitotic malignant mesenchymal cells (pleomorphic sarcoma) in a myxoid stroma with multiple cystic spaces containing blood and foci of osteoid and woven bone formation with large atypical osteoblasts (oval to-spindle shaped appearance) [Figure 2]a,[Figure 2]b,[Figure 2]c,[Figure 2]d, which was compatible with the diagnosis of cardiac osteosarcoma. Immunohistochemical study of tumor cells was positive for desmin in some cells and negative for CD31, CD34, SMA, S100, and calretinin. 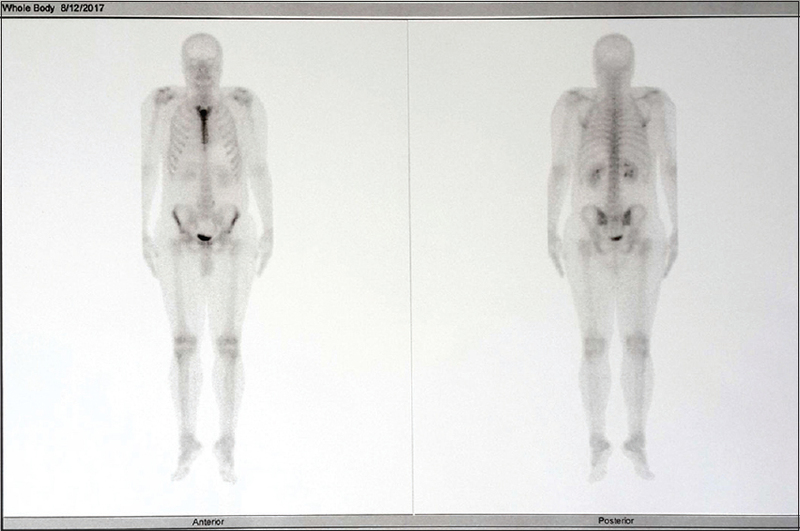 Postoperative follow-up including whole-body bone scan [Figure 3] and brain, chest, and abdominopelvic computed tomography (CT) showed no abnormal findings, and the was diagnosed as primary cardiac osteosarcoma, with no apparent metastasis. After surgery, the patient was discharged in good general condition. He was on follow-up program and there was no recurrence until 9 months. Currently, echocardiography cannot reliably differentiate an osteosarcoma and a myxoma, but certain characteristics such as large size, immobility of the mass, neovascularity, absence of a clear pedicle, multicentricity, calcification and invasion into the pulmonary veins, valvular structures, and atrial septum may suggest malignancy. Cardiac osteosarcomas can be seen as a low attenuation mass with dense calcification on CT but this is a neither sensitive nor specific finding and can been observed in other tumors such as myxomas, fibromas, rhabdomyomas, and teratomas too. Macroscopic appearance of the tumor may be similar in myxomas and sarcomas. Hence pathologic examination is essential to the diagnosis. Spindle cells, osteoid, bone, and cartilage in variable amounts are histologic features of the tumor. The mainstay of treatment is surgery. Because of the low incidence of the tumor and sensitivity of cardiac tissue, the role of chemotherapy and radiotherapy is controversial. Cardiac osteosarcoma is an aggressive tumor with high metastasis and recurrence rates, and for this reason patients often have poor survival. Metastasis of distant organs including the skin, brain, thyroid, lung, stomach, liver, kidney, muscle, and bone has been reported. The authors certify that they have obtained all appropriate patient consent forms. In the form the patient has given his consent for his images and other clinical information to be reported in the journal. The patient understands that the name and initials will not be published and due efforts will be made to conceal the identity, but anonymity cannot be guaranteed. Roberts WC. Primary and secondary neoplasms of the heart. Am J Cardiol 1997;80:671-82. Aguilar CA, Donet JA, Galarreta CI, Yabar A. 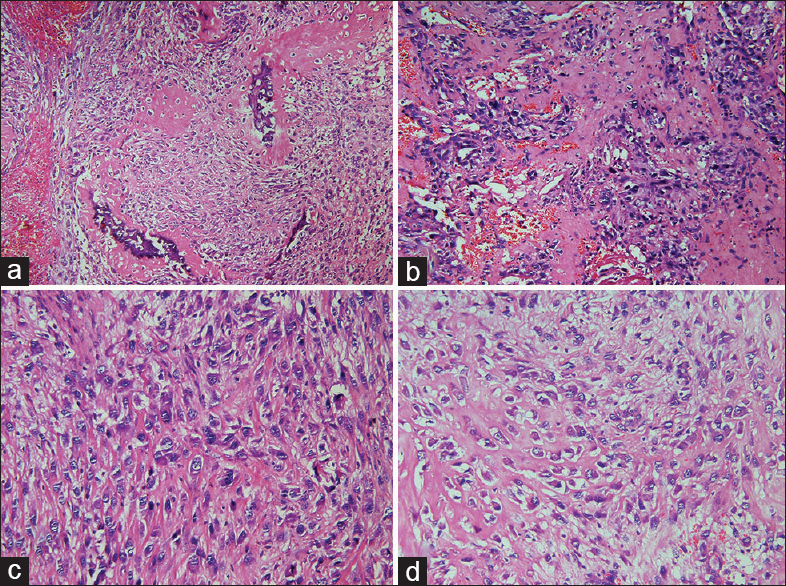 A primary cardiac osteosarcoma: Case report and review of the literature. J Cardiol Cases 2013;7:e29-e33. Burke AP, Cowan D, Virmani R. Primary sarcomas of the heart. Cancer 1992;69:387-95. Bae JH, Hong G, Lee S, Kim W, Park J, Shin D, et al. Primary cardiac osteosarcoma. Korean Circ J 2006;36:764-76. Burke AP, Virmani R. Osteosarcomas of the heart. Am J Surg Pathol 1991;15:289-95. Vander Salm TJ. Unusual primary tumors of the heart. Semin Thorac Cardiovasc Surg 2000;12:89-100. Luo H, Lei Y, Su C, Cai L, Wang T, Zou J, et al. Primary cardiac osteosarcoma in a 42-year-old woman. J Cardiothorac Surg 2010;5:120. Mich RJ, Gillam LD, Weyman AE. Osteogenic sarcomas mimicking left atrial myxomas: Clinical and two-dimensional echocardiographic features. J Am Coll Cardiol 1985;6:1422-7.